We absolutely love a “meant for me” moment! Check out the side by side images below. 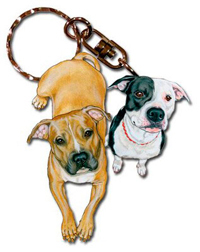 On the left is a picture of our Pitbull Wooden Key Chain Ring and on the right is a picture of one of our customer’s adorable Pitbulls. Isn’t this remarkable? It’s like this key chain was meant for her! The brown Pitbull on the left is named Brookie and the black and white Pitbull on the right is named Star. 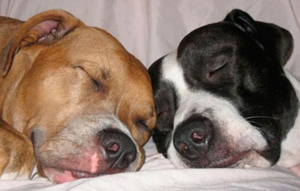 Our customer said her two Pitties are an affectionate duo, as displayed in the photo she sent us.